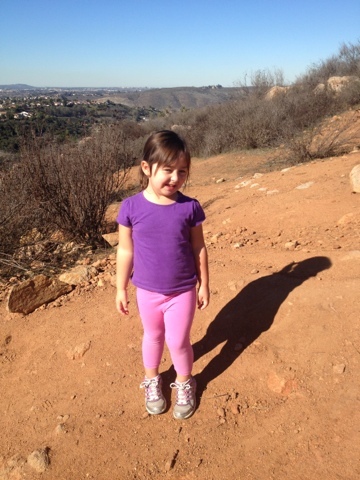 There is a "mountain" just a few miles from our house that I have hiked many times in my life. It's 1.5 miles up and at 1,500 elevation--high enough to see all around San Diego, and even to the ocean on a clear day. I remember hiking this with my dad when I was a kid. Bean and I used to hike it when we were dating. 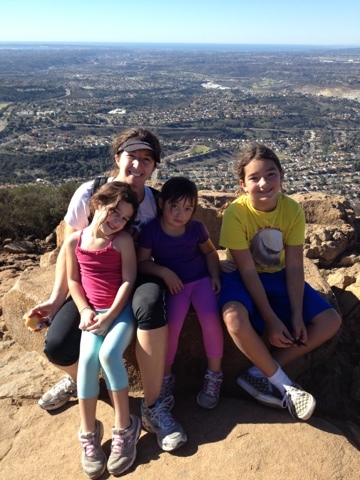 It's a somewhat strenuous hike--lots of steep uphills with a few flats thrown in. On a good day it takes about 45 minutes to get to the top. 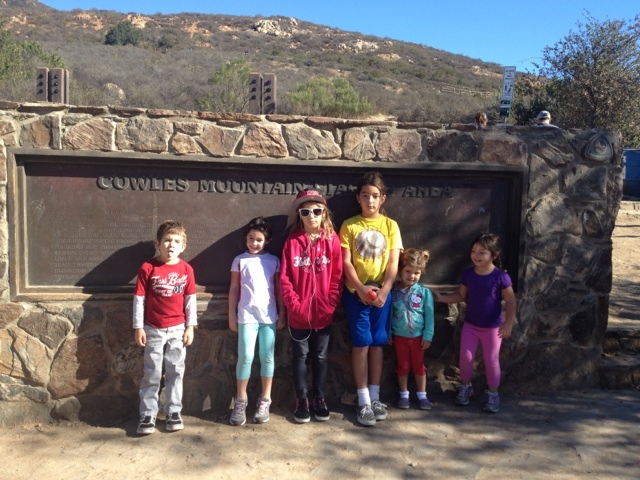 I've been somewhat anxiously waiting for when the kids were old enough to attempt even part of this hike with me. 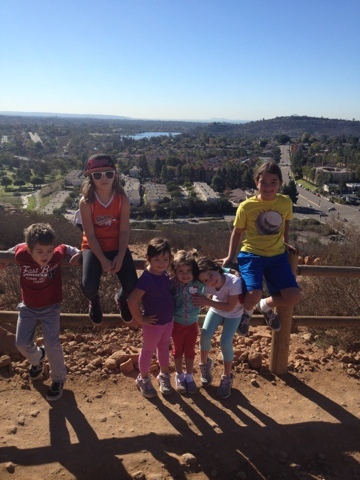 When my sister-in-law extended an invite to join them on a "get the kids out of the house during Christmas break" hike, I figured today was as good a day as any! I don't think the kids would have wanted to go with just me, but cousins and an aunt and uncle up the ante. This photo is pretty typical of these crazy kids. Poor G gets a terrible cough every winter and he's mid-cough here. Gracie is being cooperative. The Princess isn't quite sure how she feels about this, but she's here. Miss Rose's face says "I'm here, I don't want to smile, I'm reserving judgement for after." The Bambina is looking super cute in her little piggies and Lilybug is trying to "mother" her as always, even though they are only 7 months apart. I was incredibly impressed with all the kids! They were troopers and although we almost turned around about 3/4 of the way up, they gathered themselves and kept on. The kids fed off each other well and when one would shoot ahead, it would re-energize the others to follow. Lilybug was amazing! I only carried her a tiny bit towards the top on our way up. I held her hand much of the time and helped her navigate the steep turns and big rocks. The way down was a little more difficult. Stepping down big rocks is pretty intimidating, especially when your little legs are tired. There was a lot more carrying on the way down, but I just chalked it up to more calories burned for me! My sister-in-law hung with the older kids who could go down faster and my brother-in-law and I were about 10 minutes behind, mostly carrying the littlests. All the kids about half-way up. 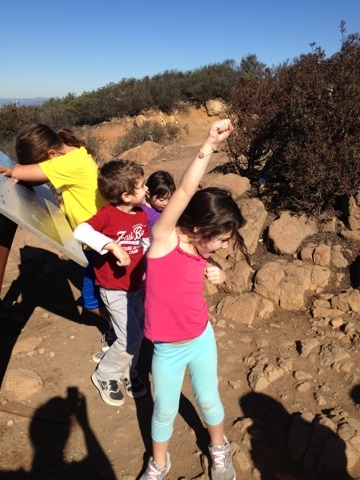 Celebrating, we made it to the top!!! And of course, Lilybug had to strike one of her infamous poses. This kid kills me. And she's only 4. The only thing missing in this photo is Bean. The blue at the top of the photo is the ocean! Of course when Miss Rose is finally smiling in a photo, Bug isn't. 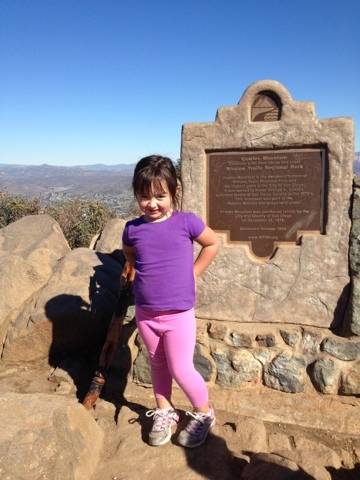 And note Miss Rose's shoe of choice for hiking...Vans. She didn't complain about her feet at all though. We didn't really have anything planned for today and this was a fun, spontaneous outing. I don't think it would have been as successful without cousins-and the promise of snacks at the top! We did spend about 30 minutes at the top before we headed down. All in all, about a 2.5 hour excursion. Another wonderful memory and time with my girls. That's what this season is all about. I love my girls!